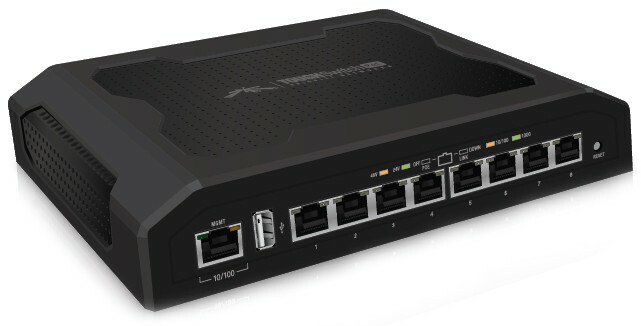 The TOUGHSwitch™ is a 5-port/8 Port gigabit, less expensive switch with 24V PoE support. It is a passive PoE device that provides 10/100/1000 mbps fast connection to Ubiquity devices and other devices in your network. The TOUGHSwitch provides an easily configurable user interface. It is easy to setup and is very user-friendly. The device has 5-gigabit ports to power Ubiquiti devices running on 24V. The device offers reliable performance for longer periods of time. 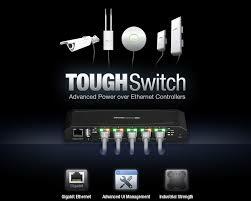 The TOUGHSwitch is a managed switch that delivers PoE (Power over Ethernet) on 10/100/1000 ports. The device features port monitoring, connection and management services, spanning tree protocol, alerts setup, ping watchdog and virtual local area network configuration. The product comes with a detailed user guide offering installation instructions, use of configuration interface, and how to manage the TOUGHSwitch with a browser-based interface. The TOUGHSwitch is easy to install. You can install it on a wall or on a desk. For outdoor installations, a category 5 grounded, shielded cables must be used. The package comes with tools to install the device on a wall. You can optionally ground the wall-mounded device if needed. Connect the PoE device to the power source, and then connect the Ethernet cable into the TOUGHSwitch management port. The TOUGHSwitch uses an intuitive user interface to access its configuration console. The configuration interface provides a browser-based interface to configure and manage the device. Start by connecting your computer to the management port on the TOUGHSwitch device. Configure the Ethernet adapter with a static IP address. Launch the web browser pointing to the URL 192.168.1.20. You can login using ubnt as the user name and password, and start the configuration of your device using the browser interface. The configuration interface provides 5 tabs to configure various functions. • Status: This tab provides status and statistics details on each port available. • Device: This tab is used to configure services and system settings for the device. • Ports: This interface is used to configure settings and services on each port. • VLANs: This interface configures virtual LANs for each port on the device. • Alerts: This tab is used to display alerts if alerts logging is enabled on the device. Pros: The TOUGHSwitch PoE is available at a cheaper price point. It is easy to program, comes with a great user interface, offers VLAN functions and provides port security. Cons: The device is limited to 5 ports and is not 802.3af compliant for 48V devices.